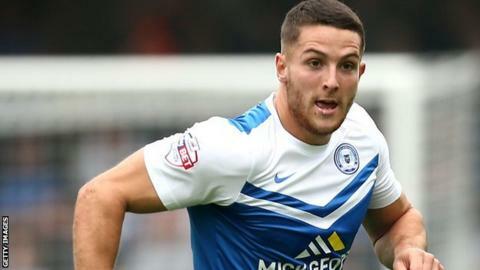 Conor Washington scored his 14th goal of the season as Peterborough overcame Sheffield United. Conor Washington was among the scorers as Peterborough claim victory over Sheffield United at Bramall Lane. Washington opened the scoring with his 14th goal of the season but Michael Smith then brought down Billy Sharp and he equalised from the spot. Erhun Oztumer put Posh back in front with a stunning long-range effort, before Jack Baldwin's own-goal made it 2-2 seven minutes from time. West Ham loanee Martin Samuelsen scored a winner for Posh a minute later. Peterborough remain in the League One play-off places, four points above Sheffield United who sit in eighth spot. Match ends, Sheffield United 2, Peterborough United 3. Second Half ends, Sheffield United 2, Peterborough United 3. Michael Smith (Peterborough United) wins a free kick in the attacking half. Foul by Dean Hammond (Sheffield United). Attempt blocked. Che Adams (Sheffield United) right footed shot from outside the box is blocked. Martin Samuelsen (Peterborough United) wins a free kick on the right wing. Attempt missed. John Brayford (Sheffield United) left footed shot from outside the box is just a bit too high. Attempt blocked. Neill Collins (Sheffield United) header from the centre of the box is blocked. Corner, Sheffield United. Conceded by Jack Baldwin. Attempt blocked. Jose Baxter (Sheffield United) right footed shot from the centre of the box is blocked. Substitution, Peterborough United. Miles Addison replaces Chris Forrester because of an injury. Delay in match Chris Forrester (Peterborough United) because of an injury. Harry Beautyman (Peterborough United) wins a free kick in the attacking half. Goal! Sheffield United 2, Peterborough United 3. Martin Samuelsen (Peterborough United) right footed shot from the left side of the box to the bottom left corner. Own Goal by Jack Baldwin, Peterborough United. Sheffield United 2, Peterborough United 2. Attempt saved. Erhun Oztumer (Peterborough United) left footed shot from outside the box is saved in the top centre of the goal. Martyn Woolford (Sheffield United) wins a free kick in the defensive half. Foul by Martin Samuelsen (Peterborough United). Corner, Peterborough United. Conceded by George Long. Substitution, Peterborough United. Martin Samuelsen replaces Marcus Maddison. Corner, Sheffield United. Conceded by Lawrie Wilson. Attempt blocked. Jose Baxter (Sheffield United) right footed shot from outside the box is blocked. Attempt saved. Billy Sharp (Sheffield United) right footed shot from the centre of the box is saved in the centre of the goal. Substitution, Sheffield United. Che Adams replaces Jay McEveley. Dean Hammond (Sheffield United) is shown the yellow card for a bad foul. Erhun Oztumer (Peterborough United) wins a free kick on the left wing. Attempt saved. Marcus Maddison (Peterborough United) left footed shot from outside the box is saved in the bottom left corner. Foul by David Edgar (Sheffield United). Jack Baldwin (Peterborough United) wins a free kick on the right wing. Corner, Sheffield United. Conceded by Ricardo Santos. Attempt blocked. Jose Baxter (Sheffield United) right footed shot from the right side of the box is blocked. John Brayford (Sheffield United) wins a free kick in the defensive half. Foul by Jon Taylor (Peterborough United).